Chat story apps are becoming more and more popular among smartphone users. Presented as short fictional stories delivered in a text message format, they’re wildly interesting and addictive to read. People relate to them due to growing up with text messages and using them often. 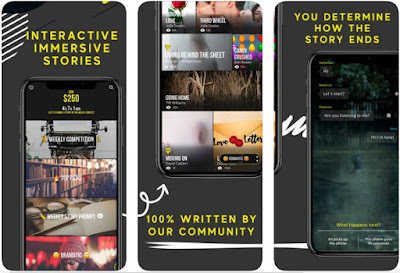 If you’re interested in reading chat stories as well we’ve picked out one incredible chat fiction app that offers you to enjoy hundreds of chat stories from different genres. Let’s see what the app is all about. What is Peek’d Chat Stories? Peek’d Chat Stories is developed for iOS users as one easy to use and user-friendly chat fiction app which offers hundreds of mystifying, bone-chilling and addictive interactive chat stories for you to read that user video, text and sound, allowing you to choose your own ending twist. As a user, you can choose to read different genres like drama, thriller, horror, sci-fi, mystery and each line of each story is delivered as one haunting chat message at a time. Getting you addicted to the stories fast, you will enjoy reading and even writing your own story to share with other users as well. The book app gives you the chance to write and read interactive chat stories which are 100% written by community users. The favorite stories on the app are voted by users through regular competitions and you as a user can vote for your favorite stories too. The app offers different story genres such as thriller, mystery, drama, sci-fi, horror and all of the stories are highly addictive and thrilling, getting you addicted to reading fast. Each of the stories is a bite-sized interactive chat story in a text format, told one line at a time. The user can tag other users, commenting and responding to make his voice hear. The app allows users to write their own stories, to interact with fans and gain followers, building a library of content that can be shared on and off the platform. The top stories will be determined by the judging panel as the ultimate winners which will win weekly cash prizes. Tell stories with emojis, images, and text to grow your followers and win your cash prize if your story is voted as one of the top stories. Users with the app get a chance to be recognized by readers and publishers. Stories for any mood can be discovered on the app by just picking your phone up and finding stories full of surprises, mystery, cliffhangers and interesting characters. Download it for free now on Google Play now to read and write addictive chat stories and win weekly cash prizes!